Tourists landing at Denver International Airport can discover many places at the airport from parking to getting to their flight. Explore the mountainous terrain of Denver, Colorado by arriving to the capital with a friendly ease that begins the minute you arrive to Denver International Airport. With friendly staff and even friendlier locals, you’ll interact with faces that are eager and ready to help. Recently redesigned, the airport is home to wide range of delicious food, interesting shops, and a variety of contemporary art pieces that are sure to hold your interest long enough to make delays feel like a blip in time. Offering over 40,000 public parking spots, from weekly rates to hourly, Denver International Airport is well-equipped for its typical high-volume flow of customers. The most economic choice is the Pikes Peak Shuttle Parking, located on-site and offering free shuttles every ten minutes. 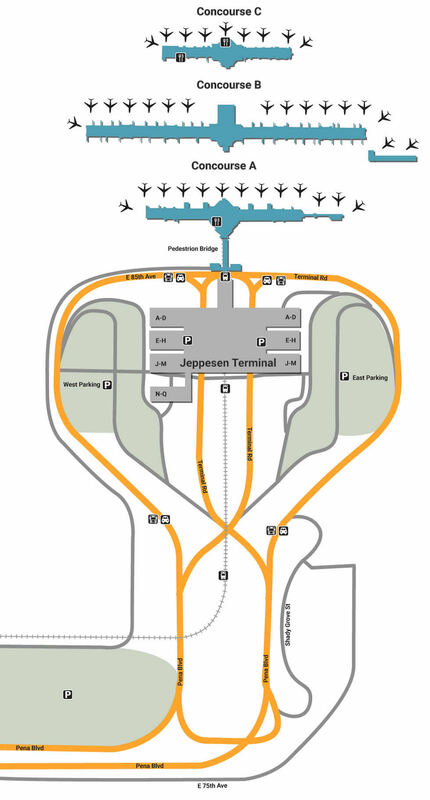 There’s also a covered short-term lot right outside of Jeppesen Terminal, not to mention two massive reservation parking garages on the East and West side of the airport. From the quirky to the typical, Denver’s airport services are not only accommodating but strangely interesting. If you have a dog or cat with you, visit one of the beautiful Pet Relief rooms, each one conveniently located post-security at Gates A, B, and C. There are also simple luxuries like battery charging stages, which are located on every level, as well as information assistance, which can be accessed through one of the many white telephones scattered across the airport. If you’re in need of a special gift for someone waiting on the other side, stop by Amore Fiori Flowers (Jeppesen Terminal) for some sweet-smelling bloom and the right card to match. If you’re keeping an eye out for in-flight snacks and reading material, head to Connections, the one-stop-shop for hours of entertainment. Keep up with your beauty regimen by stopping by MAC Cosmetics as well, located right outside the B Gates Center Core - if you happen to have a child with you, spoil them with a new toy from Kazoo & Company Toy Store, located along the Mezzanine of B Gate. Staying hungry while you wait should be a crime, especially if you’re waiting at Denver International Airport. From cheap snacks to top-notch beer on tap, the facility’s food choices are great for staying healthy while staying full. Grab coffee and breakfast at Dazbog Coffee, located near C47, and stay focused while you weave through turmoil on your way to your terminal. For something a bit more posh, Crú Food and Wine Bar (B51) is open until 10 PM, providing gourmet pizza, exotic paninis and desserts that compliment a long list of worldly wine.